← Baltimore Fashion Week as seen through the eyes of my Chinese exchange student. There was a time that I did not believe in patterns, but that was years ago, before the most recent burst of costume energy changed everything. 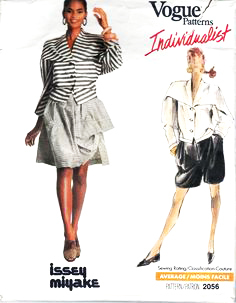 There was a time, well before this current boom, when important fashion houses showcased patterns in sections devoted solely to them and their cadre. You could find difficult patterns from some of the most sought-after names: Issey Miyake, Perry Ellis, Geoffrey Bean, Ralph Lauren, Calvin Klein, Oscar de la Renta, Diane Von Furstenberg and more were on offer. You could get a glimpse into how a famous designer’s pieces were put together using these patterns. One of my favorites, Issey Miyake, was an exercise in faith. When you folded point A to point B, jumped on one foot while spinning widdershins, and said “seam ripper” three times to your reflection in your shears, you’d have a finished garment. It always worked, and it was always amazing when it did. It was always an education, and I adored it. Then the “Vogue Designer” and “Individualist” sections that housed these patterns disappeared and it seemed like things trended toward simple and easy patterns all over. There was no way that I was going to spend money on a pattern that was simple. I did, however, still believe in inspiration and education. There were some patterns that I still looked for. They were not current fashion, and they all offered loads of information, and illustrated other options and techniques for construction that was not in the usual sewer’s tool box. They also offered a glimpse into the ideals of fashion of another time or culture. Education is everything. The more you have, the bigger the pool of inspiration you have from which to draw for your own work. The first set of patterns that found a home in my studio were the Folkwear line of patterns. The company has been sold at least twice and, as I recall, the first time was because the brand was just not profitable. I am not sure what changed, or what the new magic business model is, but I am very happy to see Folkwear Patterns has become an enduring name. A bonus point of the patterns are the history and technique sheets. They open up ways of doing things that will make your sewing stand out from the rest. Need to learn how to make a knotted frog? Go check out the Chinese Jacket pattern. Want to try out quilting, but can’t seem to bring yourself to cut up fabric and put it back together flat again? Maybe you have an unfinished quilt top burning a hole in your ironing table. The Quilted Prairie skirt will be a wonderful way to go. All of their patterns are a great library to have on hand. I also did, and still do, a lot of costuming. Sometimes it’s easier to let someone else who is really steeped in the era do the research for you, or at least augment and confirm what you have dug up on your own. For this reason, I also kept a few of the “Past Patterns” around. Most of the time they have actually had their hands on a period piece, so they can see for sure where the seams should go, and what the details actually are. If you can’t get your hands on a sample to do your own research, these are a quite useful way to go. Then there is the dazzling area of actual vintage patterns. They are quaint jewels, each of them. They also offer insight into the period via pattern instruction verbiage. They are a sort of cultural anthropology class in an envelope. They offer truly vintage looks, without the problems of stains, tears, or the disintegration you find in actual garments of the era. You will, however run into some not-insignificant differences in fit and sizing. Ignore the size on the envelope and go by the measurements on the package, and you will be fine. Along with the big four, look for defunct pattern company gems like Advance, Pictorial Review, and Blackmore. It’s like watching a classic black and white movie. Things have taken quite the turn in the last few years. It used to be that there were only a few small pattern houses that catered to the historical costumer, and none for costume. Past Patterns, Folkwear, and The Mantua Maker were among them. The four major pattern companies rolled out their “costumes”, which included their historical offerings, only at Halloween, with a small section that remained in the general pattern book year round for the church pageant and community theater communities. As the costuming world became more than a niche hobby, that marketing plan changed. The boom in costuming, fueled by old guard costumers and the burgeoning throngs of the newer cosplayers, has created a demand for a wider range of more fanciful and expressive patterns. We have still have designer patterns, and the addition of a broad selection of costume, historic, and cosplay patterns in the mainstream pattern companies is a clear indication that creating by sewing is appealing to a broader range of consumers. With a shift from fashionable mainstream to self expression, flavored with both history and fantasy, we are seeing some magical offerings. It’s a pattern renaissance. Now the hot patterns come from the stars of the cosplay community. Costumes from the likes of Yaya Han, American Duchess, Firefly Path, Theresa LaQuey, Anachronism in Action, and Loriann Costume Designs are found in abundance. McCalls has even launched a new web-based selection of patterns meant to specifically to serve the cosplay community: Cosplay by McCalls. It’s all about self expression, and there is an abundant supply of materials out there to help you create your own personal look.